I’ve been brushing up on my Avaya. Bottom line is there is more there than I thought. Avaya is a complex subject and it is hard to put it all into words, so I figured I’d put it all into their words, and created a word cloud from my notes. A “cloud” seemed appropriate for the subject matter. As with most word clouds, the bigger the font the more relative importance of the words. Relative importance either because it is important or because Avaya wants it to be important. 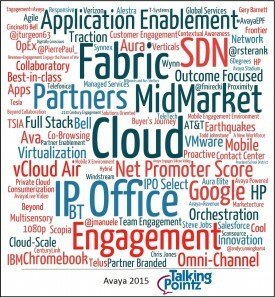 Avaya 2015. Click to enlarge. Word clouds are a bit tricky and inherently subjective. This one was based on the messaging that I heard at the recent analyst events that Avaya hosted.”Fabric” (switches) and “IP Office” are about the same size not because they represent the same amount of revenue (far from it), but because they they got about equal footing at the events. Avaya is onto something with shortest path bridging and really wants its partners to ‘engage’ with network switch opportunities. Avaya is now all about engagement – it is the new term for the desired result from the Thneeds that they offer (“which everyone needs” Theo Seuss). To me Avaya feels renewed. More clarity in their direction and lots more excitement. The portfolio is large – enterprise and mid market, contact center applications, app-dev environments, SDN solutions, video solutions, and an emerging cloud orientation. Avaya kept referring to itself as a cloud company which seemed suspicious at first, but they have made tremendous progress with both direct services (AvayaLive) and with enabling partners via opex technologies. I said more clarity, but that’s a relative thing. In many ways, Avaya is its own worst enemy. Like most vendors, Avaya works hard to differentiate its products and services. Sometimes the differentiation gets lost in translation. For example, there were multiple slides used in presentations that were so confusing that I could find no one able to explain them (among both Avaya employees and industry analysts). Avaya also uses some industry terms in unique ways. There actually is a reasonable story underneath it all, but it can be difficult to decipher. Avaya recently announced a new arrangement with VMware and its enterprise-class, hybrid cloud service called vCloud Air. This enables hybrid implementations for Avaya contact center and UC (customer and team engagement) solutions (see Sheila’s post). If you haven’t heard of vCloud Air, you are not alone. The service was only launched about two years ago initially under the name of VMware vCloud Hybrid Services, and has estimated quarterly revenue around $85 million. The service is intended to merge VMware’s traditional private cloud technologies with public IaaS technologies to better compete against AWS and other infrastructure services. By partnering with Avaya, VMware expands vCloud Air to business applications such as the mission critical contact center (Customer Engagement) services. Coincidentally? VMware also announced last week a vCloud Air partnership with Google. This includes an integration with Google Cloud Storage, Google BigQuery, Google Cloud Datastore and Google Cloud DNS. Together, it seems VMware intends to double-down on vCloud Air with mission critical applications and services. These moves could prove to be strategic for all involved companies. The vCloud Air service should be able to leverage public services for things like disaster recovery very effectively. vCloud could prove to be highly strategic for VMware. Research firm TechNavio estimates nearly 50 percent of enterprises will have hybrid cloud deployments by 2017. Avaya also reports it is working with Google, but has only announced (so far) an Agent applet for Chromebooks. 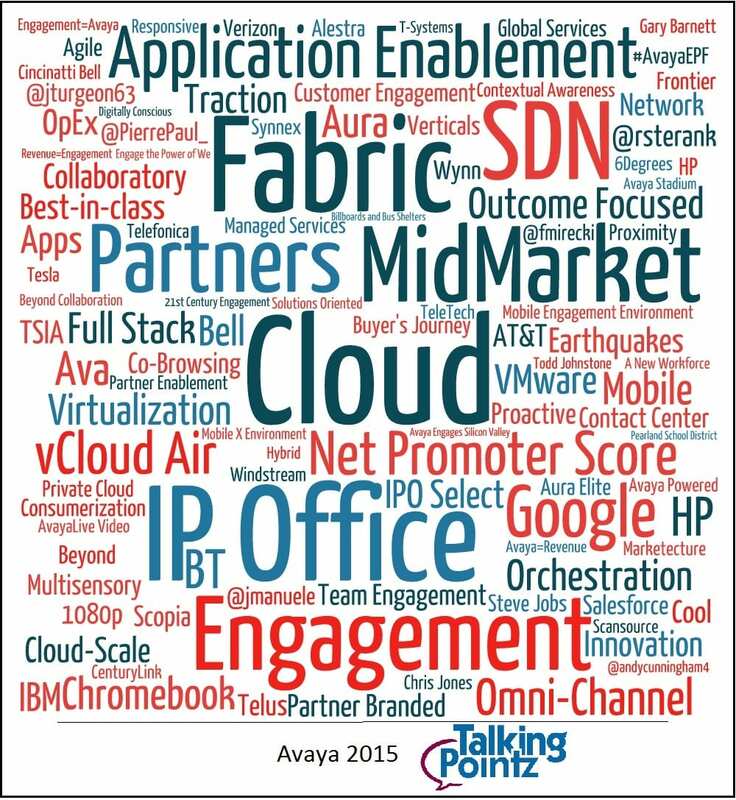 Actually, I expect Avaya to make many new partnership announcements in 2015. The company has lots of “big friends” and seems intent to turn them into go-to-market partnerships.